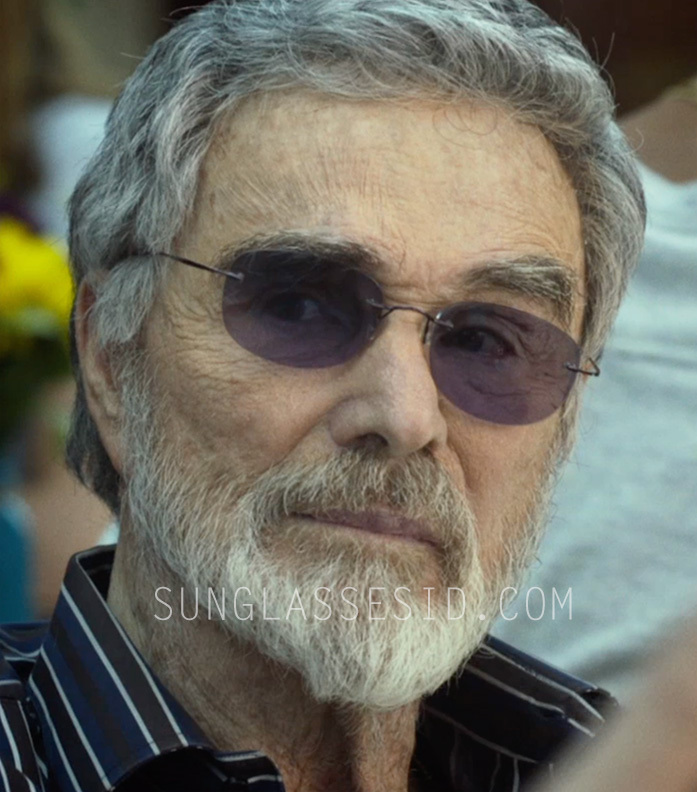 Burt Reynolds wears a pair of light weight rimless sunglasses with flexible hingeless arms in The Last Movie Star. Close up of the light weight rimless sunglasses with flexible hingeless arms in The Last Movie Star. In the movie The Last Movie Star, Burt Reynolds wears a pair of light weight rimless sunglasses with flexible hingeless arms. One pair has dark / blue lenses and black arms, while another pair he wears later has red lenses. This is a style of glasses that Burt Reynolds also wears in his private life. he is often spotted with red lens rimless sunglasses. The exact brand of the glasses is unknown, but similar style sunglasses can be found on Amazon and eBay for less than $30.